Product prices and availability are accurate as of 2019-04-03 21:06:38 EDT and are subject to change. Any price and availability information displayed on http://www.amazon.com/ at the time of purchase will apply to the purchase of this product. High quanlity new ink cartridge compatible for select Canon Printers.Replacement for Original Model: Canon PG-40/CL-41. Compatible Printer: Canon Pixma iP6210D iP6220D iP6310D iP6320D iP1180 iP1200 iP1300 iP1600 iP1700 iP1800 iP1880 iP1980 iP2500 iP2580 iP2600 iP2680 MP140 MP145 MP150 MP160 MP170 MP180 MP190 MP198 MP210 MP218 MP220 MP228 MP450 MP460 MP470 MP476 MX300 MX308 MX310 MX318, Fax JX200 JX210P FAX-JX201. 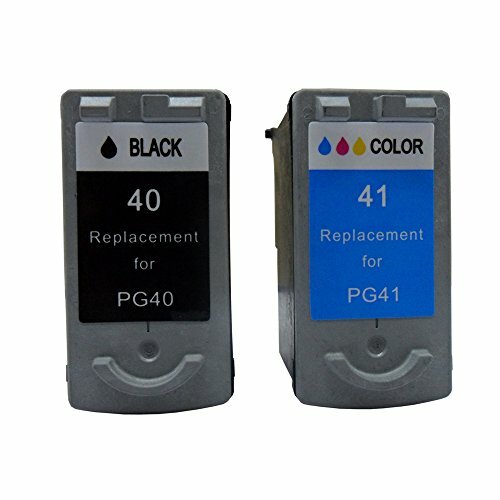 High quanlity new ink cartridge compatible for select Canon Printers 1 year replacement warranty,30-day refund guarantee after the purchase. Replacement for Original Model: Canon PG-40/CL-41.